One lumen is equivalent to the amount of light a single birthday candle emits in a square foot-sized area. Televisions have been the dominant force in home entertainment for decades, and it's easy to see why. TVs require little effort to set up, display a crystal clear picture, and offer all-in-one convenience with integrated streaming and voice controls. But what if you want to dream bigger? For home theater setups, there's no better option than a 4K projector. 4K projectors offer clarities that match modern TVs, but with much larger screen sizes, making them the easiest way to create a personalized media paradise. Once you experience your favorite film or video game with a 4K projector, there's no going back. 4K projectors come in many different flavors, but the easiest way to distinguish them is by projector bulb technology. DLP projectors (digital light processing) are the most sought-after variety on the market and use a matrix of microscopic mirrors laid out on a semiconductor chip to project images. DLP projectors are powerful performers with excellent 3D support, and generally feature bulbs that last between 2,000 and 5,000 hours and can typically be replaced. LCD projectors use liquid crystal displays and are much more affordable than their siblings, but they necessitate more filter maintenance and can suffer from dark color distortion. Finally, LED projectors use light-emitting diodes, and because of this, their bulbs last significantly longer and require significantly less attention than the alternatives. They aren't quite as bright as LCD or DLP models though, which makes them best suited for smaller rooms. Dedicated home theaters with no ambient light need 1000 lumens or more. Rooms with a small amount of ambient light should have at least 1500 lumens. Spaces with high ambient light, such as those with windows, need 3000 lumens or more. There's a plethora of 4K content available these days, but there's a solid chance not all your media is of that resolution. To compensate, certain projectors make lower-resolution images from DVDs and Blu-rays, as well as streaming and a cable source, look better through post-processing. Projectors with these features generally range from $1,500 to $2,000. Like televisions, the majority of 4K projectors use HDMI cables to connect to cable boxes, streaming sources, and media players. Wireless HDMI connections are becoming more and more common though, which is great news for those interested in cutting the cord. Projectors that support this feature generally range from $2,500 to $3,200, but keep in mind you may need a separate HDMI transmitter depending on the unit. Manually adjusting your projector's lens isn't a very precise way to align your picture, but thankfully, you don't have to. To adjust your picture without the hassle, seek out a projector with a lens shift feature, and do it with the push of a button. Expect to find this feature on 4K projectors priced $1,500 and up. Nothing ruins immersion like a loud, clattering fan playing during your favorite film or TV show. Most projectors have fans due to the powerful bulbs inside, but some are quieter than others. To reduce noise, seek out projectors with "whisper quiet" fans that produce 30 dB or less, and read user reviews for honest feedback. Also, consider mounting your unit away from the seating area if possible. Q. What else do I need to complete my home theater setup? A. Projectors and media players only make up part of the home theater experience. To complete your setup, you'll need a projector screen or projector screen paint, an HDMI connector, and an audio system. We also recommend buying extra projector bulbs so you can replace them on the fly if one burns out. These bulbs are expensive, but it's worth purchasing a spare or two up front to avoid hassle later. Q. What is the best way to install my projector? A. 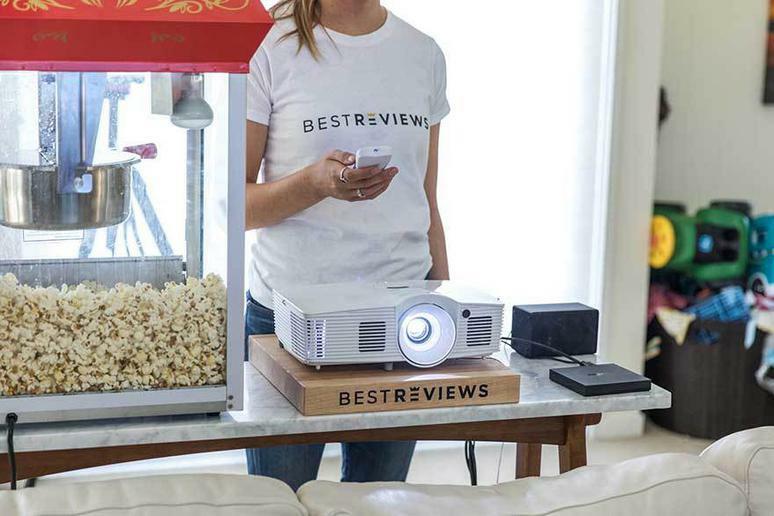 Every setup is different, and some home theater designers simply plop their projector on a table. This can work for some, but you risk noise pollution from the fan, tripping hazards, and shadows if someone walks in front of the unit. Mounting your projector on your ceiling presents a significantly cleaner look, but it requires slightly more elbow grease - as well as mounts and screws - to complete. Q. How long do projector bulbs last? A. Projector bulbs don't last forever, and their lifespan is typically referred to as "lamp life." LED projectors feature the best lamp life on the market, as their diodes can last up to a whopping 20,000 hours. LCD and DLP projectors are noticeably less sturdy, with average lamp lives ranging from 2,000 to 4,000 hours. Replacement lamps cost between $200 and $400, so factor this into your purchasing decision. Our take: This Sony projector is the closest thing you'll get to movie theater quality inside your own home, and it's shockingly simple to use. It's the last projector you'll ever buy. What we like: Feature-rich yet intuitive, the VPL-VW285ES is easy to connect to your streaming box, computer, or cable box, and it boasts outstanding upscaling. Images remain crystal clear even with screen sizes of 167 inches. What we dislike: Buyer beware, this unit costs nearly twice as much as other premium 4K projectors. Our take: Optoma's UHD600 offers stunning HDR quality with an ultra-bright, 3,000-lumen display. What we like: This model features an extensive set of inputs to work with a variety of devices and can be easily adjusted for different rooms. Equips a 1.6x zoom for screen sizes of 140 inches and up. What we dislike: This model is expensive, but you get what you pay for. Our take: Epson's Home Cinema 4000 projector flaunts outstanding video clarity and upscaling abilities, along with impressive 3D capabilities. What we like: We loved the 20 dB quiet fan, 10 lens presets, and 2.1x zoom, all of which allow you to mount the projector in any place you like without sacrificing quality. What we dislike: This unit does not feature an audio output or speaker.